Antique Tiffany-style Blue Floral Torchiere Floor Lamp Iron,69''H. 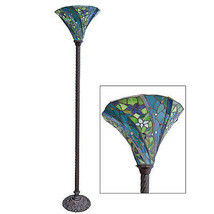 Home » marciatreasures' booth » Antique Tiffany-style Blue Floral Torchiere Floor Lamp Iron,69''H. FABULOUS ANTIQUE TIFFANY STYLE BLUE FLORAL MOTIF FLOOR TORCHIERE LAMP. BRAND NEW. IT MEASURES, 15'' X 69''H. AMAZING ADDITION TO YOUR CHIC HOME OR OFFICE. THANK YOU FOR YOUR INTEREST!